The world-first 'Between Two Worlds' exhibition features perspective-shifting installations and intricate optical illusions from two very different creators. Combining the hypnotic works of M.C. Escher, one of the 20th century's most celebrated artists, with the design aesthetics of acclaimed present-day Japanese design studio Nendo, the National Gallery of Victoria's newest blockbuster exhibition Between Two Worlds discovers a stunning and unexpected middle ground. The first ever merging of these acclaimed creators, the exhibition features more than 150 of Escher's woodcuts, lithographs and sketches. Described as the NGV's most ambitious exhibition design to date, Nendo — led by renowned designer Oki Sato — was invited to produce the spectacular space that features several large-scale rooms and installations, and reflects upon the complex themes found within the surrounding Escher works. 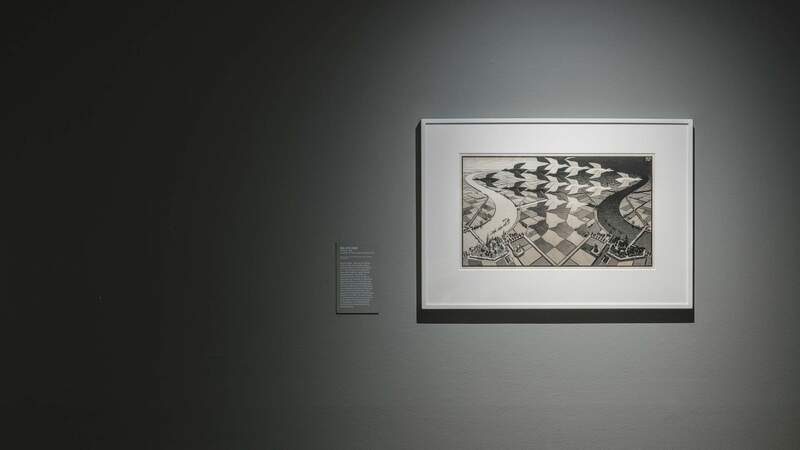 Running until April 7 2019, Between Two Worlds covers the full spectrum of Escher's artistic vision, which was largely ignored during his lifetime. 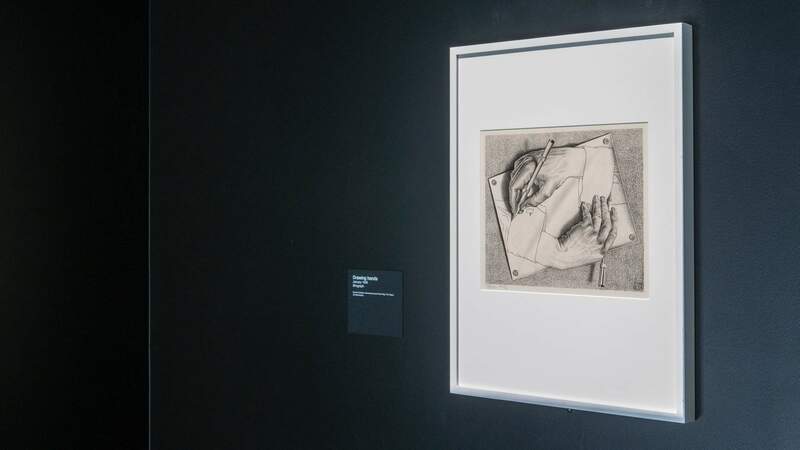 Showcasing everything from Escher's early works as a student, his newfound inspiration while travelling across Italy, and his final creations in the lead up to his death in 1972, the exhibition showcases virtually all of his most famous works, including Drawing Hands, Relativity and Day and Night. Mirroring the optical illusions and mathematically inspired works of Escher, Nendo has contributed a variety of immersive spaces that will warp your perspective and bring a new light to the works displayed throughout the exhibition. Conveying Escher's theories through the studio's own motif, the rudimentary outline of a house, it appears in various shapes and forms throughout the exhibition and references Escher's unique perspective on space and patterns. With not one, but two creative geniuses on display at the NGV's newest exhibition, we've selected six works (three Escher, three Nendo) that you can't miss out on seeing at Between Two Worlds. Perhaps the Dutch artist's most celebrated work, Day and Night perfectly illustrates Escher's uncanny ability to combine art and science with resounding impact. Uniting a complex understanding of mathematics and perspective with his undeniable creative talent, here, Escher depicts two Dutch towns attached by a series of rolling hills that melt away into a soaring flock of birds. At once day and night, real and unreal, this woodcut offers two simultaneous perspectives that remove the distinction between foreground and background. Another widely known artwork of Escher's that has been reproduced in various pop culture mediums since its creation in 1947, Drawing Hands is a clear example of Escher's obsession with paradoxes. Produced in a more photorealistic style than many of Escher's other works, this lithograph displays two hands conceiving each other into existence. While conveying Escher's interest in the concept of infinity, it also demonstrates his desire to produce two-dimensional drawings that leap off the page. Finished in 1969, Snakes was the last work that M.C. Escher would ever produce. But while he might have passed away just a few short years later, this piece demonstrates just how highly advanced his work became. 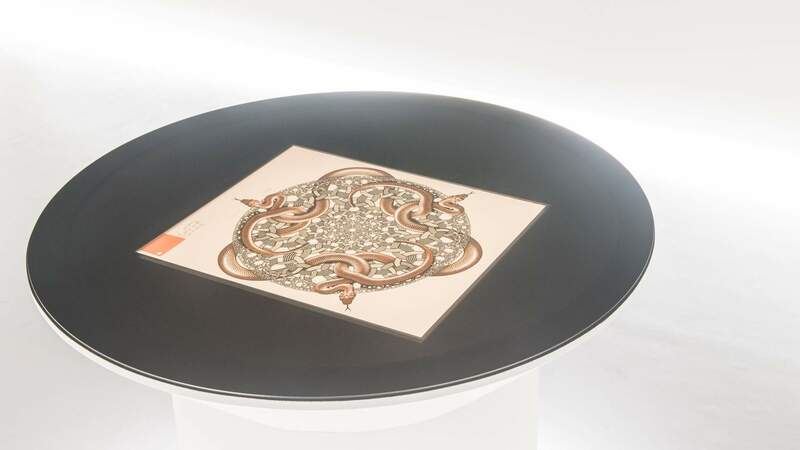 Showcasing Escher's legendary understanding of symmetry and interlocking arrangements, the work features a rotational symmetry as snakes weave their way between an ever-shrinking pattern. 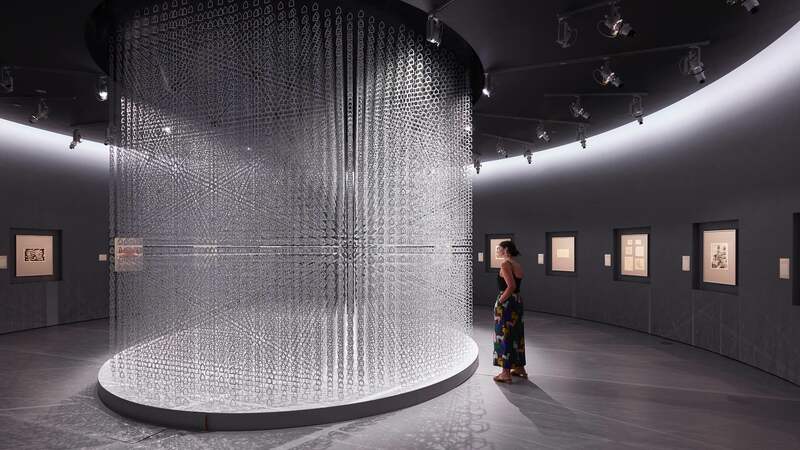 Recognising the significance of this artwork, Nendo has produced a specially designed space, Snake House, where a brightly lit pathway serpentines through an otherwise dark room and ends with the work. 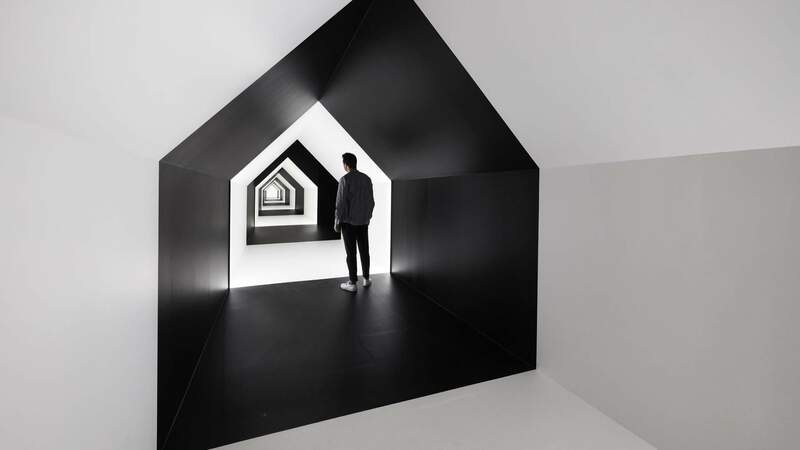 Serving as a connecting corridor between two of the exhibition's distinct rooms, Zooming House is a vast architectural structure that once again recalls Escher's obsession with perspective and illusion. Following the same house motif seen throughout the exhibition, here the pathway starts as a wide four-metre chasm before gradually shrinking into a tight 55 centimetres. The contrasting black and white pattern amplifies this effect before you turn off into another hypnotic space. Both luminous and reflective, while the floor-to-ceiling rods in this room first appear to be simply an interesting way to display Escher's works, on closer inspection — when viewed from a specific spot in the room — the rods merge together and the form of Nendo's house motif appears. Here, you'll find a selection of Escher's most mind-bending drawings and prints. While this grand circular space is dedicated to Escher's many works fixated on the concept of infinity, it's hard to ignore the massive Nendo installation featured in the centre of the room. Constructed from thousands of miniature house motifs, the dazzling installation echoes Escher's artworks presented throughout the space, which explore eclectic geometric loops and images of limitless tessellation. 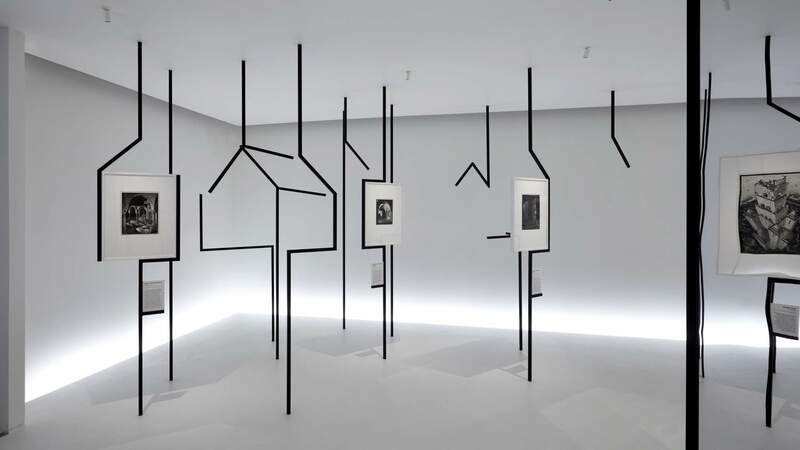 Escher x Nendo: Between Two Worlds is on display at NGV International, St Kilda Road, Melbourne until April 7, 2019. You can grab tickets here.